I really wanted to do more nail art. But I have been suffering from a nasty and persistent cough for almost 3 weeks now. However, I was going back to the beach and I just can't go with bare nails. So I did my nails, enduring the occasional coughs. My mood was terrible, but my spirits were high. I didn't need to struggle for an idea. 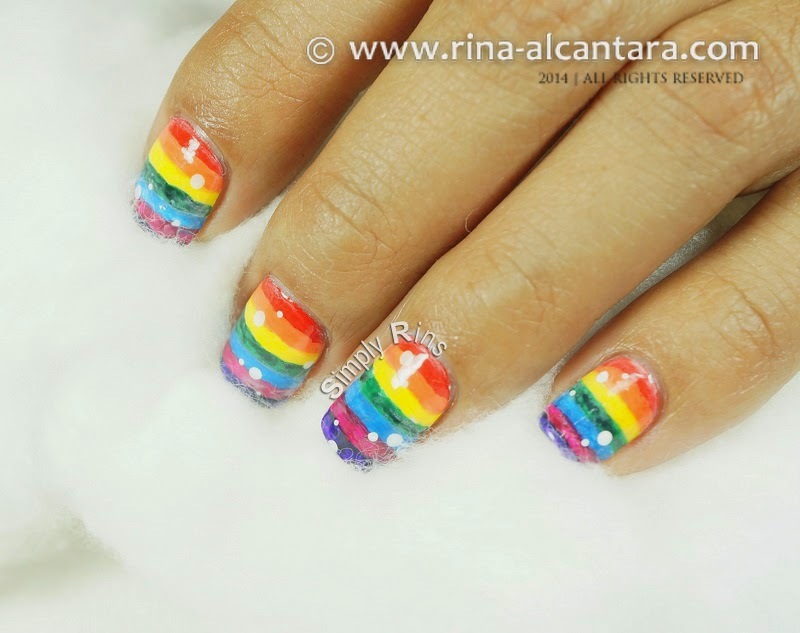 I needed a rainbow nail art to cheer me up ... and, to accompany me to the beach. 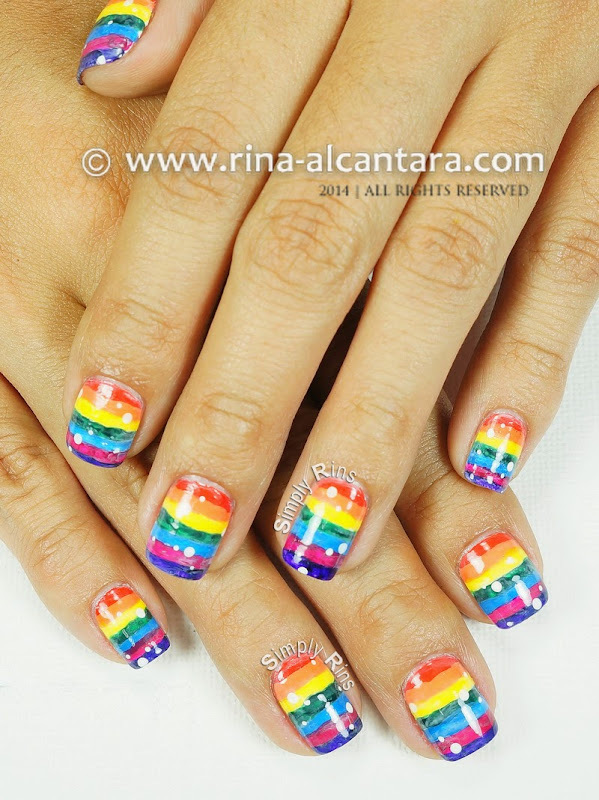 There's a lot of rainbow nail designs done by several nail art bloggers/artists. Using stripes is probably one of the most popular technique used. I decided to do the same. I didn't want to worry about precised lines so I figured I'd use the dubbing method to paint the design. 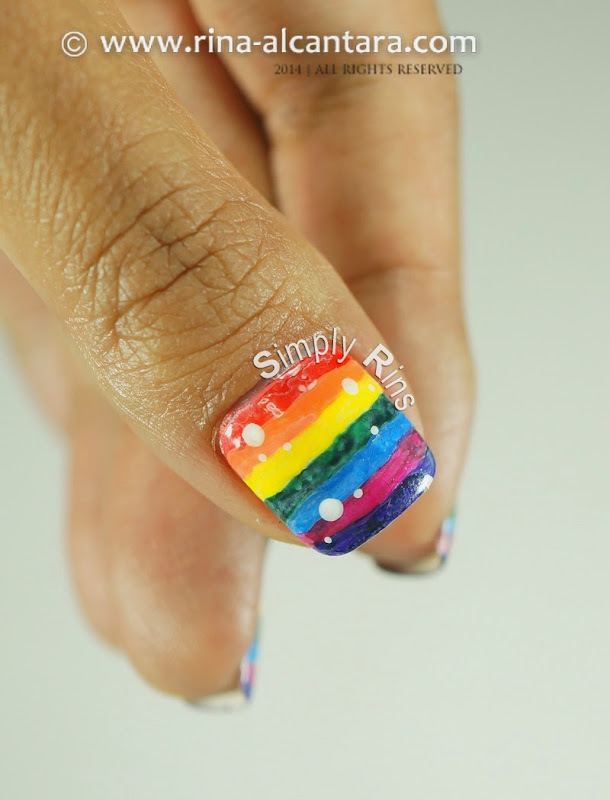 I used a flat angled nail art brush for this freehand rainbow nail art instead of a striping brush. If you'd like to have defined lines, you're better off with the latter. OPI Alpine Snow was my choice of white base nail polish. I used 2 coats. And I painted the design with acrylic paints. I followed the ROYGBIV pattern for the color sequence and decided to start near the cuticle area and finish at the tips. This is one nail design that fully covers the nails. This is fairly easy to do, even with a non-dominant hand. But as I finished doing the nail on my pinky finger (I do one nail first to see the result), I felt I needed to add something more. I thought that a washed out or faded look would look good. So after painting the rainbow stripes, I lightly brushed a very thin/watery white acrylic paint over the entire design. It was an experiment that worked. I got that washed out look I wanted. The washed out effect will depend on how thin the white paint is. All I did was water down the paint on my palette, pick it up on the angled brush and lightly stroke it on the design. I didn't have time to do a video tutorial on this, but I really wanted to. Oh, and I added a few random dots before sealing the nail design with top coat. I have no other reason why I did it except that I thought it would make the nail art more interesting. Sort of like an addition to the faded effect? It make look awkward to some, but I loved it. I'm enjoying the summer here in the Philippines by traveling to amazing beaches. And I'd make sure to decorate my nails so they could share my enjoyment. 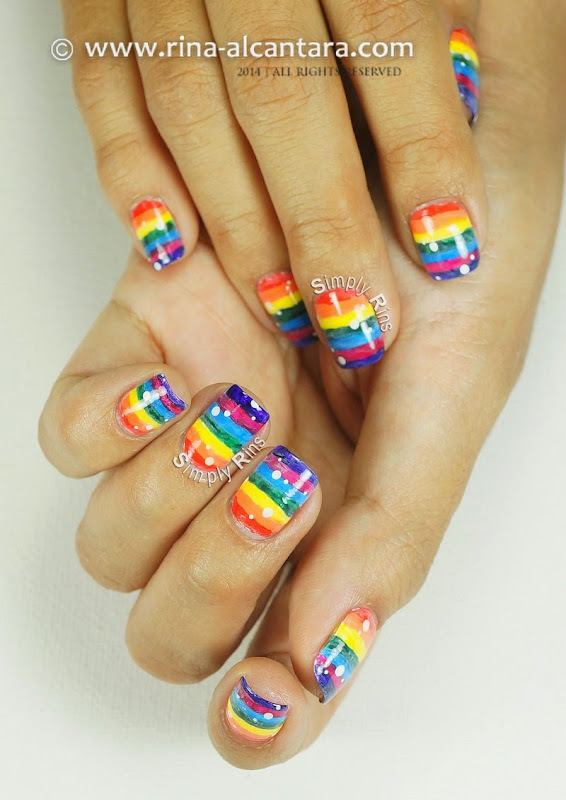 Have you done a rainbow nail art? What twist did you add to personalize it? Please share with me your thoughts. 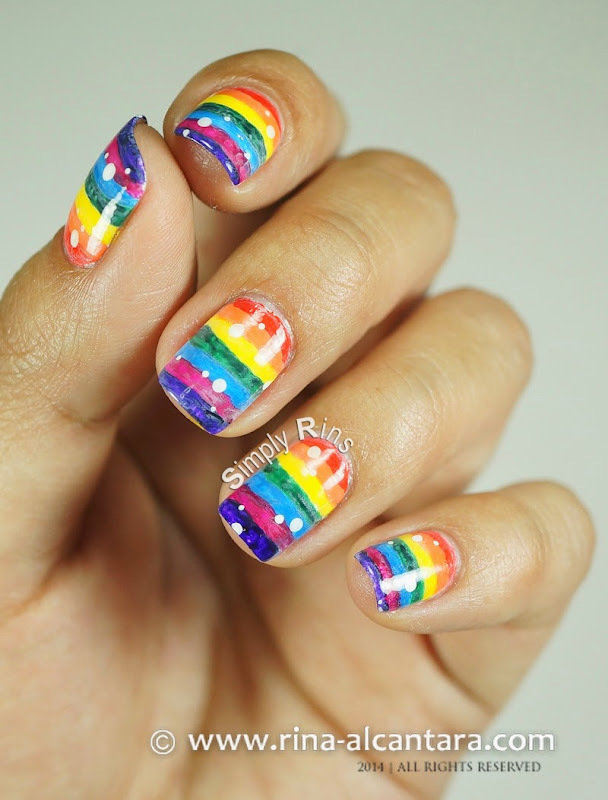 Is this Washed Out Rainbow Nail Art a thumbs up? These are so pretty and bright for springtime! I adore rainbows! Thanks so much for sharing! Miss seeing your posts. Hope all is well with you and that you are enjoying your summer.